Gem Smashers is a fun puzzle game with eight worlds and over 100 levels. Help the three heroic creatures who escaped capture during the invasion of the Earth to rescue their friends. Travel the world springing, spinning, and smashing the crystal cells where their friends are imprisoned. 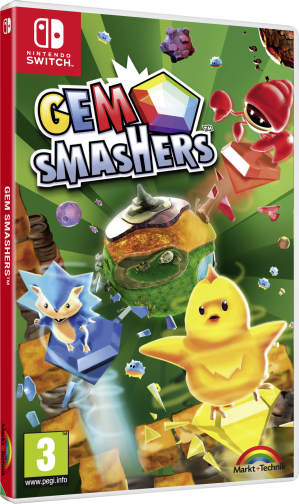 Save the Earth from the evil IMBU and put your skills to the test with Gem Smashers. •	Story Mode: Contains 8 worlds with over 100 levels. Choose a Gem Smasher and complete all of the zones to reach IMBU’s spacecraft. Bounce up and down the map and hit colour-changers to match the colour of the gems to smash them. Smash all the gems to open the door and complete a zone. •	Battle Mode: Compete against a friend. Grab a 2nd player and get ready for some frantic multiplayer action. Smash as many gems as you can before the time runs out. •	Extras: Unlock bonus content by playing through Story Mode. •	3 different characters to choose from, each with their own unique speed, bounce and style. Copyright (C) 20192019 Funbox Media Limited. All rights reserved. E&OE All dates and ratings are subject to change. Company Registed in England No. 07183974.